I've never met anyone who didn't have any critics. And it's a really, I think, a difficult part of life to deal with, and it's a part of life that you can't not deal with it, you can't just ignore it and think it'll go away. And it's a part of life that can have a massive influence on us. You know? A new book comes out. I'll get a thousand emails from people saying they love the book. I'll get one email from someone criticizing, you know, something on line four of page whatever. Which one will I go to bed thinking about? The critic. It's a tragic flaw, it's a tragic flaw, and I probably have it more than most people. But the truth is, is that we have to be really careful about the voices we allow into our lives. We have to be really careful about the voice of criticism in our life. You see, the voice of criticism can be a voice of coaching. But the voice of criticism can also be a, a voice of distraction and a voice of discouragement. And one thing that God does not want you to experience, is discouragement. God doesn't want you to get down, you know? We get down because we think it's our work. The truth is, whatever we're trying to do, it's God's work, you know? And guess what? He can handle the critics, you know? But we let the critics, very often, take a very powerful place in our lives and not just, "Hey OK, obviously I'm living a public life as an author and as a speaker." But you've got your critics. Might be your mom, might be your dad, might be your grandma, might be your mother-in-law, your sister-in-law, could be anybody. But you've got critics and you cannot let their voice run rampant in your life. You have to, I think at some point, learn to bring the criticisms to God and say, "Alright God, here they are. You know, if there's something here you want me to work on, you know, give me some indication you want me to work on it. Otherwise teach me to detach from this and not get discouraged by this." Because when we get discouraged we, we spend a lot of energy on something that has nothing to do with the mission. And I think it's important to ask ourselves, you know, "Is what this person is criticizing, is it going to help the mission? Is gonna help me do the mission better?" Great! If it is, take it on. Doesn't matter who says it, doesn't matter how much you like them or don't like them, if he can help you become a-better-version-of-yourself, great, let's take it on board. Let's separate it from the personality of the person who said it and let's take it on board. Let's become a-better-version-of-ourselves. If it can't help us do the mission better, if it won't help us become a-better-version-of-ourselves, it's incidental. And we've gotta give it the gate. We've gotta set it aside. We got to press on with the mission. Mission is king. We're made for mission. God’s made you for mission. Anything that distracts you from the mission isn't of God, you gotta learn to set it aside, and stay focused and never get discouraged by the critics. Everyone's got critics. Everyone's got critics and what the critics do, is they stop us from acting. They stop us from actually doing something and they distract us to just be thinking about stuff. It's a very, very subtle way . . . It's, it's resistance. Resistance will use criticism because resistance hates action. Resistance hates when you actually do something. Resistance loves when you sit around moping about what the critics said about you. Resistance loves that. What God wants you to do, he wants you to step out of that discouragement. He wants you to break through that discouragement. He wants you to go out and do something. He wants you to act. He wants you to press on, do whatever it is he's calling you to do right now. The critics will always be there, but we need to be careful not to allow their voices too much space in our hearts. Reflect on a time when you allowed critics to have too much influence in your life, and how you would do it differently next time. Jesus, help me persevere when I encounter critics. In those moments, help me to simply do the tiniest thing to move forward. I know you will do the rest. Today’s personal reflection features Dynamic Catholic team member Steve Lawson. Steve is our director of communications. He comes to us from Buffalo, New York. Steve loves gummy candy, has a secret desire to be Darth Vader, and, yes, the blonde streak is natural. 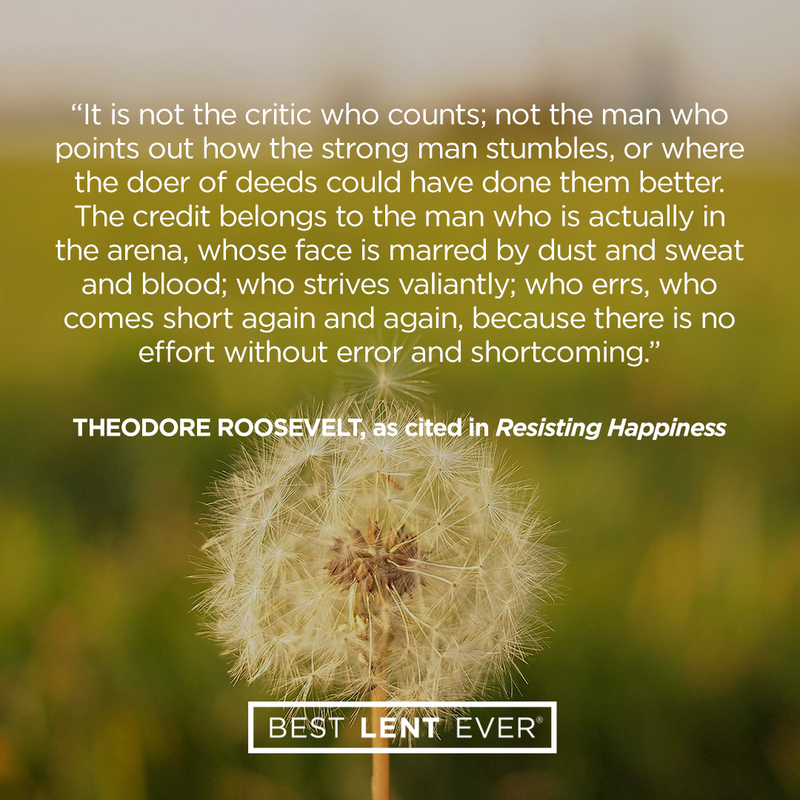 How have you overcome critics in your life?